Last outfit pictures of the year. Forgot I had these on my memory card, these were taken the day before the snow came. Then I just left these waiting, only wanted to have a white snowy background on the pics and christmassy feeling. But now that the year changing, time to show the last ones I have. Here you can see the best thing I bought 2014 on my opinion, the classic Chanel bag. With my many years old wool coat, soft scarf and safe colors: grey, black and white. Gotta say I’m excited to leave this year behind. It could have been better, but every little thing happened brought me here. I’m ready for 2015, feels like starting fresh on a new page. New page, new me, new things happening. Anyone else feeling like the year changing is something much bigger than just a normal Wednesday changing to Thursday? Can’t wait for tomorrow, time to party and raise a glass for the changes, for all the tomorrows and forget the yesterdays. Viimeiset asukuvat tältä vuodelta. Nämä olivat muistikortilla odottelemassa, kuvattiin asu juuri päivää ennen kuin lumi tuli, ja sittenhän halusin vain lumisen jouluisia asukuvia. Nyt kun vuosi vaihtumassa, oli loistava ajoitus löytää nämä. Tuntuupa hyvältä että vuosi vaihtuu, olen niin valmis aloittamaan (taas) puhtaalta pöydältä, unohtamaan eiliset ja suunnittelemaan huomisia, elämään paremmin hetkessä. Tuntuu että se vuoden vaihtuminen on jotain paljon suurempaa, kuin vain keskiviikon vaihtuminen torstaiksi. Kellään muulla samaa fiilistä? Tai uuden alun houkutusta? Toivottelen varmaan huomenna pikaisesti hyvät uudet vuodet täällä ajastettuna, joten ei nyt enempää, vielä paljon puuhaa! Huomenna saa hengähtää ja juhlia. 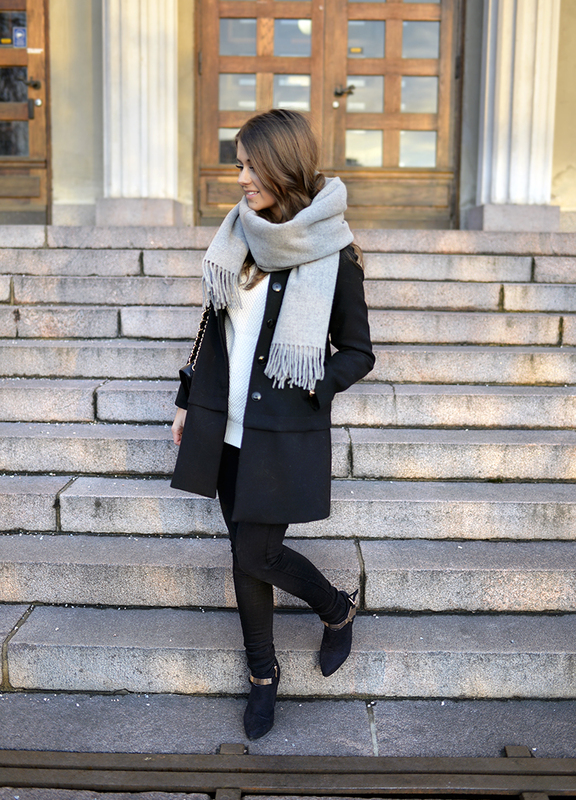 love your outfit, the shoes, the scarf – and of course the bag! Simply beautiful. You look so pretty, love your shoes ! Love the outfit! Where is your knit from? I actually don’t really feel different, it’s just the day calender starts again in January, for me a new year starts at your birthday. So it’s just a more normal day I’ll spend with my family at the holiday house in Austria…tomorrow we’ll go! But I hope you’ll have a great evening, have fun and happy new year! I think the new year is a great opportunity to reinvent ourselves, make changes and improve our lives. All we need is the right mindset. I used to think “ah, it’s just a new calendar”, but this didn’t do me any good”. I’m glad to see you are happy Marianna. I wish a wonderful new year for you, your family and friends. Yeah, same feeling here. Let’s drink for all tomorrows and forget yeserdays! Yes exactly! 🙂 All the best for you too, I agree, it will a be good good year! Love this bag ! Really beautiful look. Lovely outfit. I love the booties and the jacket! So nice pictures, especially like your shoes – looks super stylish! Btw you’re so inspiring, you can make a simple outfit looks so good and fashionable ! Great to hear that you are so excited for the new year! I always think it’s a special moment when we go to a new year, in my head I’m going over the past year in a few seconds, reflexing on the great things I did, places I’ve been, people that came and went… I’m always a bit sad to leave the year behind, but I definitely look forward to more good things in 2015! I really love your shoes over here, the really add something cool to the outfit! Always looking stylish and beautiful! Love this minimalistic outfit! Love this outfit! Can´t wait to see what you´re gonna show us in 2015 😀 Happy New Year cutie! You look so FAB, great coat and shoes! I love your Chanel bag! Such a classic! That scarf looks so cozy! Have a wonderful New Year! Love the gold accent from the booties, it adds a touch of glam to the casual chic outfit! Very elegant bag too, such a classic beauty! This is such a lovely look, and your Chanel is to die for! That is such a great purchase! 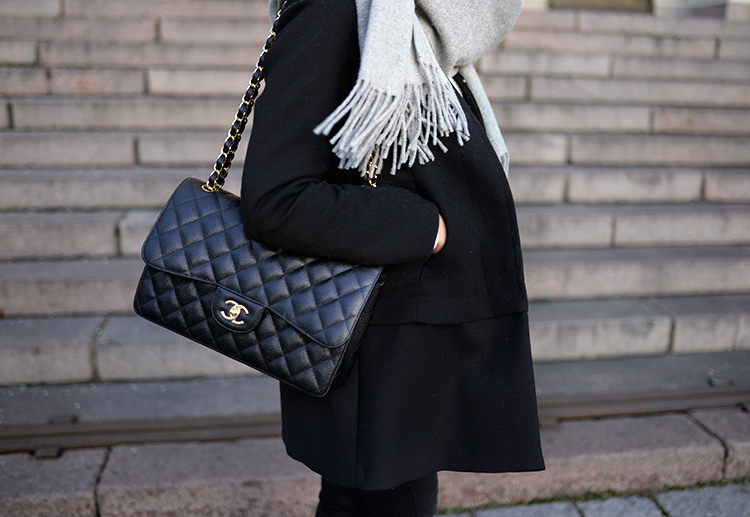 You can never go wrong with a classic Chanel. This look is so effortless! Tää vuosi on ollu harvinaisen stressava eikä niin mukava ja moni asia olisi voinut sujua paremmin, joten vuosi 2015 on erittäin tervetullut! 😀 oon niin valmis uudistuksiin ja “aloittaman puhtaalta pöydältä”. Tavoitteena on ainakin kokkaustaitojen parantaminen, kotijumpan ja -joogan lisääminen, uusien tavoitteiden laatiminen ym. Tehdään vuodesta 2015 hyvä! 🙂 suurin ensi vuonna tapahtuva muutos on koiran ostaminen, joten sormet ristiin että kaikki tulee menemään hyvin hihi. I love your classic, casual outfit 🙂 I think this is a great bought yes, this will last forever! Best wishes for the New Year and have fun tonight! That bag is gorgeous! And this outfit is pretty good. Simply beautiful. You are such a classy lady! I love your blog, it has been inspiring me since I discovered it. A short question, I want to buy a new camera and I was wondering what camera do you use to take your pictures.